Chandrayaan 1's Moon Impact Probe, which successfully hit the lunar surface on Friday, Nov. 14. The mission is run by the Indian Space Research Organisation (ISRO). Chandrayaan 1, India's first deep space mission, released its Moon Impact Probe for a suicide nosedive to the lunar surface, it was announced on Friday. The probe hit the earth's moon at exactly 8:31 p.m. Indian Standard Time (10:01 a.m. EST), 25 minutes after being released from its carrier spacecraft, run by the Indian Space Research Organisation (ISRO), Indian news organizations reported. The event reportedly generated images and data, but those have not been released yet. The robotic mothership successfully entered lunar orbit on Nov. 8 after its two-and-a-half week journey from the Satish Dhawan Space Center on India's east coast. The Moon Impact Probe weighed 64 pounds (29 kilograms) and rode atop the deck of the main orbiter. The impactor was set to be released once the spacecraft reached its final circular orbit 62 miles (100 kilometers) above the moon. The probe had miniature Indian national flags painted on four sides, meant to commemorate the birth of the country's first prime minister, Jawaharlal Nehru (known as Children's Day). It was to "signify the entry of India on Moon," an ISRO official told the Press Trust of India. The main objectives of the probe were to explore the lunar surface at close range ? while on the way down ? and to test out technologies for future soft landing missions. A radar altimeter to measure the probe's altitude above the lunar surface. A Video Imaging System that was to snap photos of the moon as the probe descended. A mass spectrometer to measure what's in the almost non-existent lunar atmosphere. Chandrayaan means "moon craft" in Sanskrit. 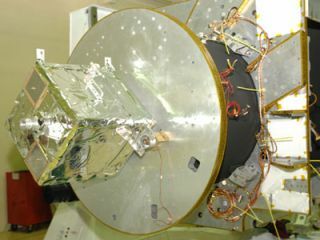 The $80 million mission, which includes three instruments supplied by the European Space Agency, is a precursor to the planned Chandrayaan 2, which will carry a Russian rover and a lander and is currently slated to be launched between 2010 and 2012.